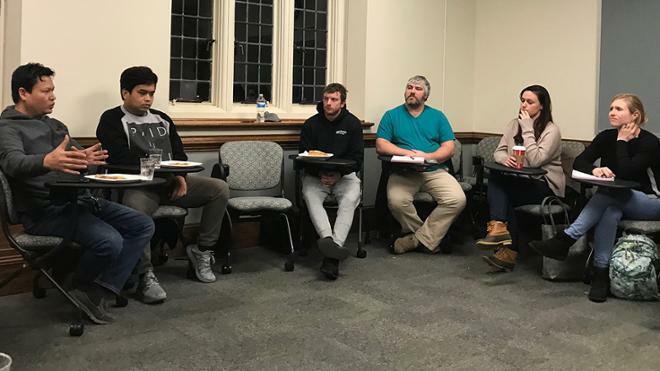 As teacher candidates discussed classroom management related-topics this semester, Assistant Professor Bob Spires and his students continued to revisit topics of diversity. In order to connect to real issues of diversity, Dr. Spires invited a group of local Cambodian community leaders — all of whom attended, or whose children attended, Richmond area public schools — to chat with students in his classroom management class. Several members of the community agreed to participate in a roundtable conversation with teacher candidates. The discussion focused on the parents’ experiences as new immigrants while attending, or parenting, students attending local public schools.